Made from leftover QSWO from a cabinet build this simple door bell design replaced a cheep plastic one. Still in working order I was able to use the old bell mechanism. The top and bottom are attached with 1 1/4” #6 stainless steel screws and caped with 3/8” ebony plugs. . 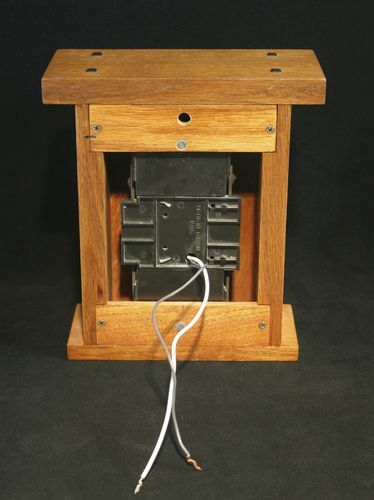 The wood for the face of the doorbell was resawed to about 9/64” to give the doorbell a guitar type sounding board which gave the bell a more musical sound. Very cool it sure dresses up a plain old doorbell.nice work. I get it now. finally. 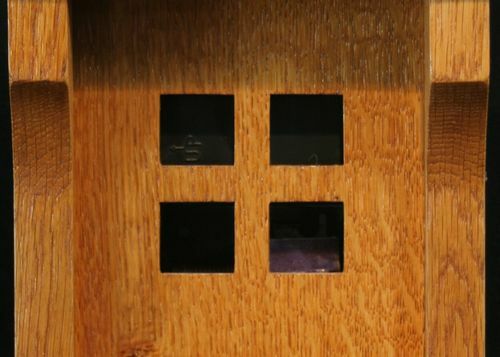 This Arts and Crafts door bell is so nice and it makes a fine accent for any home. Nice example of arts & crafts style. I’d like to thank splinter group for the great suggestions and help with photography and understanding white balance. 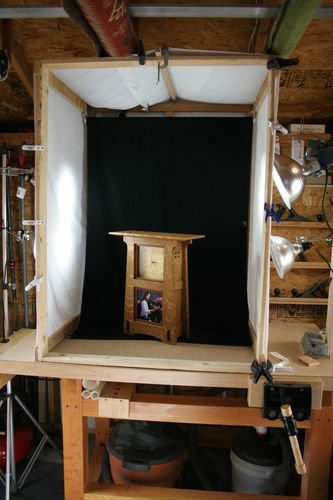 Here’s a light box/tent I built using scrap wood, old white sheets and 90 watt LED 5000K (daylight) flood lights I bought at Walmart mixed in with a Halogen flood. You nailed it, arts and crafts on the head! Nice addition to homes that want to preserve their heritage! DING DONG! Nice Doorbell James. Well Done! Congrats on the Top Three! Great looking A&C doorbell cover—I’m sure you’ll enjoy it every day! I don’t know, if your doorbell sounds better than ours, but it looks much much better for sure! That’s really a clever idea. Hides the unsightly plastic housing LOL I think I will need to design something over my door bell soon.